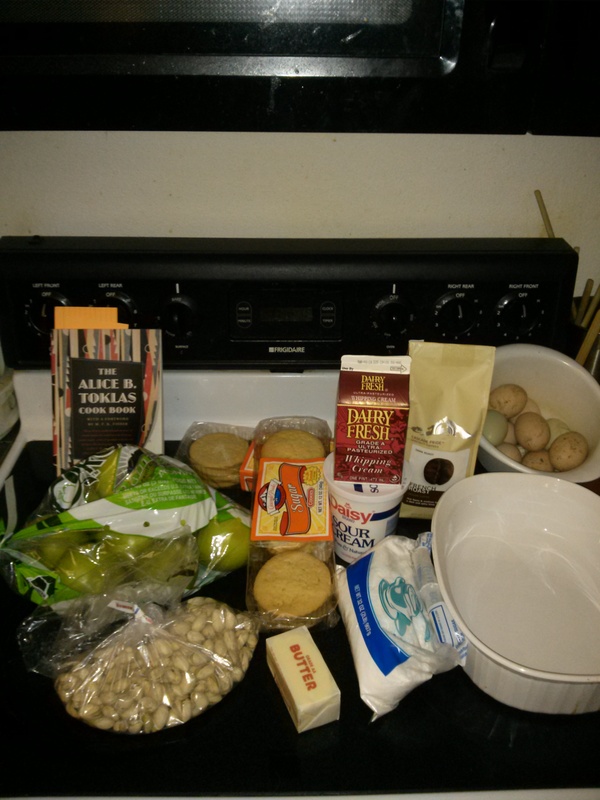 The Alice B. Toklas Cook Book … made (in)famous by the haschish fudge recipe! There is a movie called “I Love You, Alice B. Toklas!” … the title of which was inspired by Alice B. Toklas’ most famous recipe: how to make haschich fudge (cannabis brownies). However the adoption of cannabis brownies by the 1960s counterculture happened years after Toklas originally recorded the recipe. The Alice B. Toklas Cook Book, a memoir of French cooking and travel by Alice B. Toklas, was first printed in 1954. This memoir recounts the life and times of Toklas, who was the partner of feminist writer Gertrude B. Stein. The book tells their adventures through the lens of cooking. Because of their ability to own a house, buy paintings, host a dinner with Picasso (yes, the painter), and to hire their own cook… that they were financially very well off while they lived together in Paris. In fact they lived in Paris during both World War I and World War II. 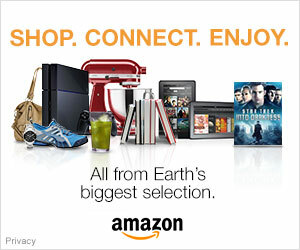 chose two recipes that fit within our budget and that I could possibly do with two rambunctious children in the house. Both of the recipes my wife chose were desserts. Great for my wife! However I do not like desserts and I do not like most candies. So these desserts would be made mainly for my wife to taste and eat (if they turned out edible). Following is my brief memoir of how I made ‘Bird’s Nest Pudding’ and ‘Coffee Icing’ using the Alice B. Toklas Cook Book. Tuesday, January 21st, 2014 I sat in my office making a list of all the ingredients I would need to make these desserts. After a quick exchange of text messages with my wife, I discovered we had icing sugar (powdered sugar). So I left my office and headed to the grocery store to pick up all the things I would need for these recipes. 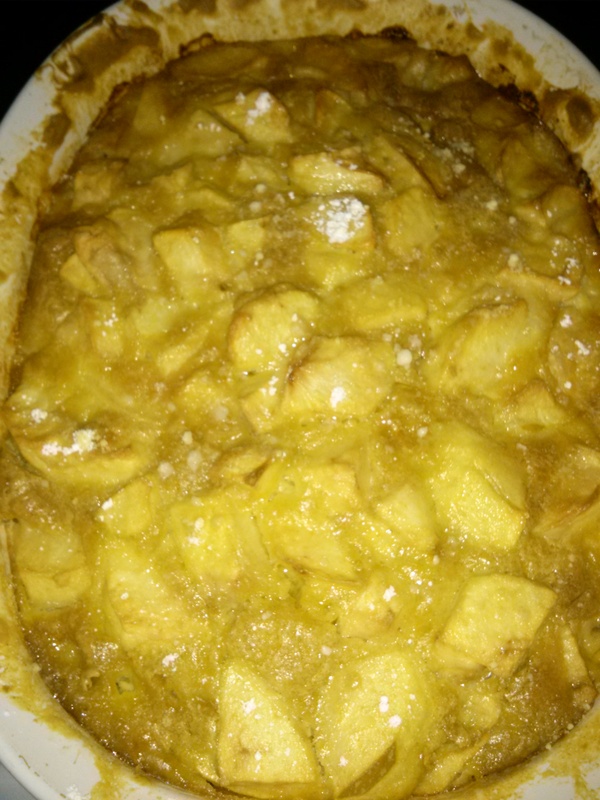 Butter a porcelain pudding dish, slice 8 apples into it, sprinkle with sugar. Pour over them a batter made of 1 cup sour cream, 1 cup flour. 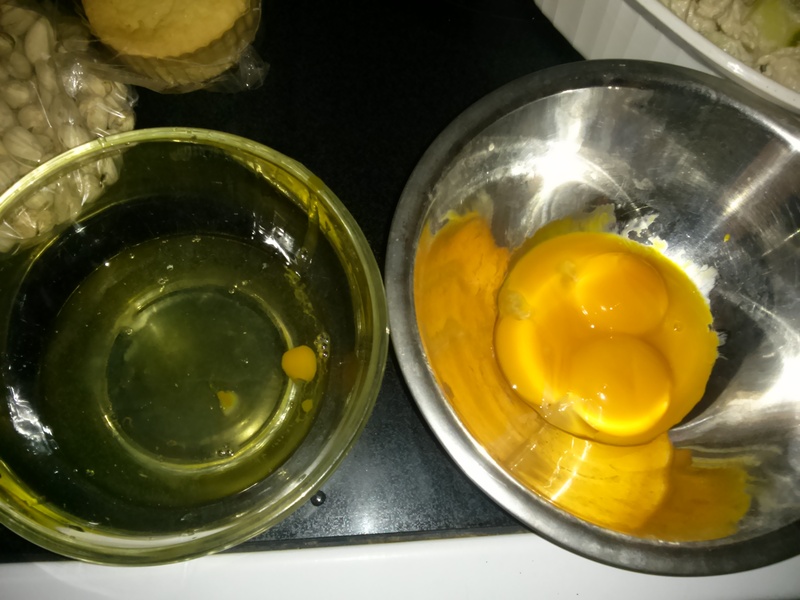 Mix well, add the yolks of 3 eggs and 1 cup milk in which has been mixed 1 scant teaspoon baking soda. Bear the whites of 3 eggs, fold into mixture. Bake for ½ hour in medium oven. Brush the top with melted butter and sprinkle with sugar. Brown for 10 minutes. Serve with sweetened heavy cream. This is a pudding we should not neglect (The Alice B. Toklas Cook Book – 1984: page 129). In an enameled saucepan put ¾ cup very strong black coffee. Add enough icing sugar to make a very heavy cream. Warm over low heat. Pour on cake and with a spatula cover top and sides of cake. 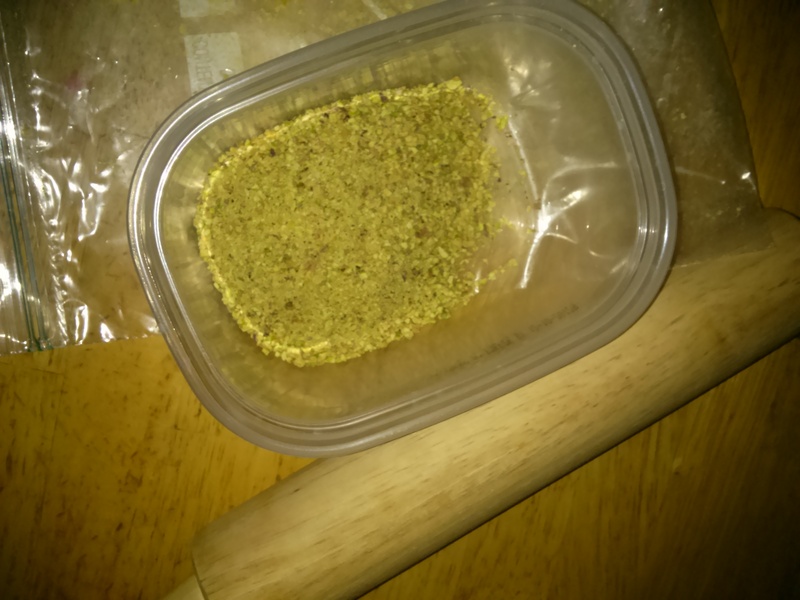 Sprinkle thickly with finely ground pistachio nuts. (The Alice B. Toklas Cook Book – 1984: page 70). After spending roughly $12 (US) at the grocery store, I drove home and set to cleaning the kitchen. I cannot cook in a dirty kitchen. This is not to imply my wife keeps a dirty kitchen, but that we have different standards of clean. Furthermore we have two foster kids who make keeping anything in the house clean. Again, Toklas and Stein could not have had children considering the types of foods they were able to indulge themselves with. So, after roughly ten minutes of cleaning the kitchen I reached for the Alice B. Toklas Cook Book. It wasn’t where I thought I left it. I checked my backpack, and then the bedroom and living room. It was 6:52 p.m. and I began to have a sinking feeling. No, I did not think one of the kids had eaten it. But I did consider, strongly, that I may have left the cook book in my office. After another futile minute of hunting I drove to campus… found the book on my office desk… and drove home. Annoyed with myself I was now ready to begin cooking at 7:37 p.m. I set the oven to preheat to 400 degrees. There was no mention of how hot to bake the bird’s nest pudding, but I know many things bake at 350. I have a cooking quirk to preheat the oven to a higher level than I intend to cook at because I do. There is no psychobabble analysis needed here because preheating to a higher temp is just something I do. 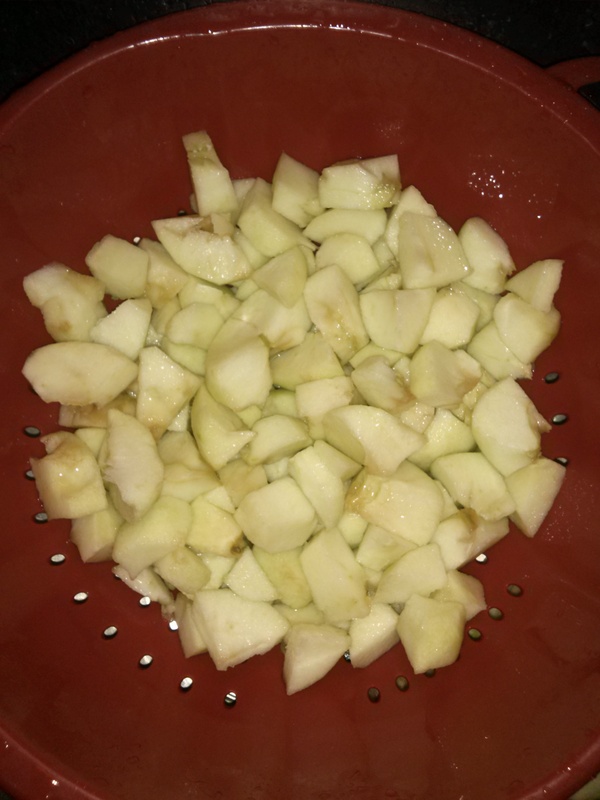 Anyway, while the oven was preheating I peeled eight apples and sliced them up. In addition I brewed a cup of strong black coffee. At 8:05 p.m. 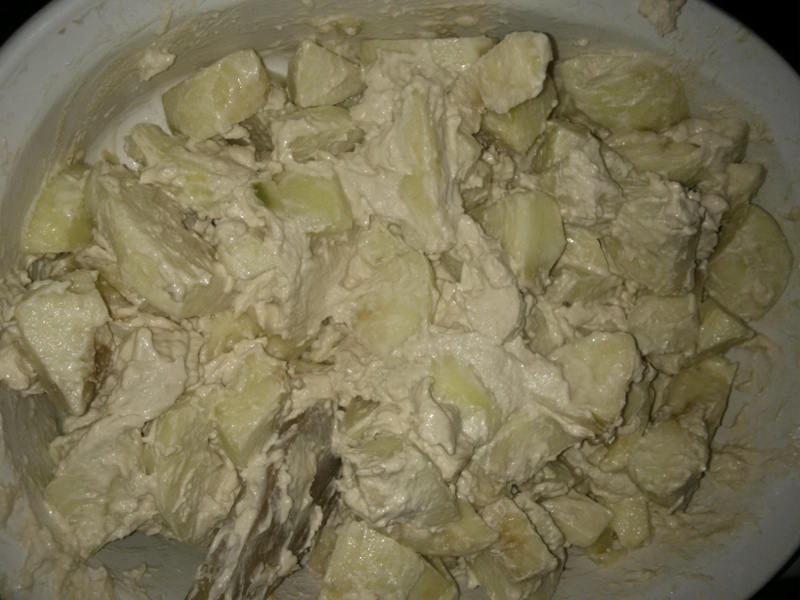 I finished peeling and slicing the apples and put them in the porcelain dish. I then mixed in the sour cream/flour topping, followed by the eggs yolks mixture, and finally I added the egg whites mixture. I sprinkled on sugar and put the bird’s nest pudding in the oven at 8:28 p.m. I turned the oven down to 350 degrees. At 8:30 p.m. I focused on the coffee icing. The coffee was finished brewing. To this I added A LOT of powdered sugar. The directions noted that I was supposed to add enough to make a very heavy cream. What did that mean? I was unsure, but I stopped adding sugar after dumping two cups of powdered sugar into the 3/4ths cup of black coffee. 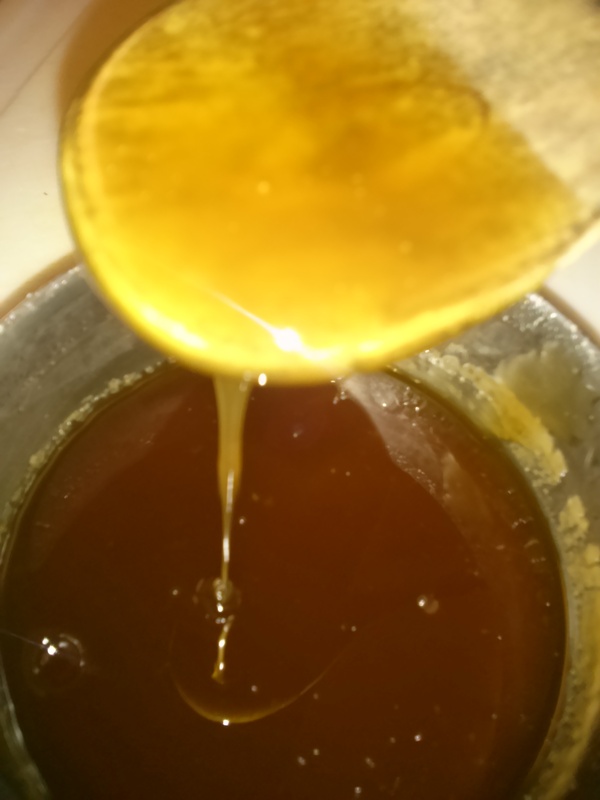 It looked like honey syrup boiling in the pot instead of a very heavy cream. I hoped that when it cooled it would thicken like many sauces do. To crush the pistachios, my wife helped me remove the shells, and then I put the pistachios inside a Ziploc bag. 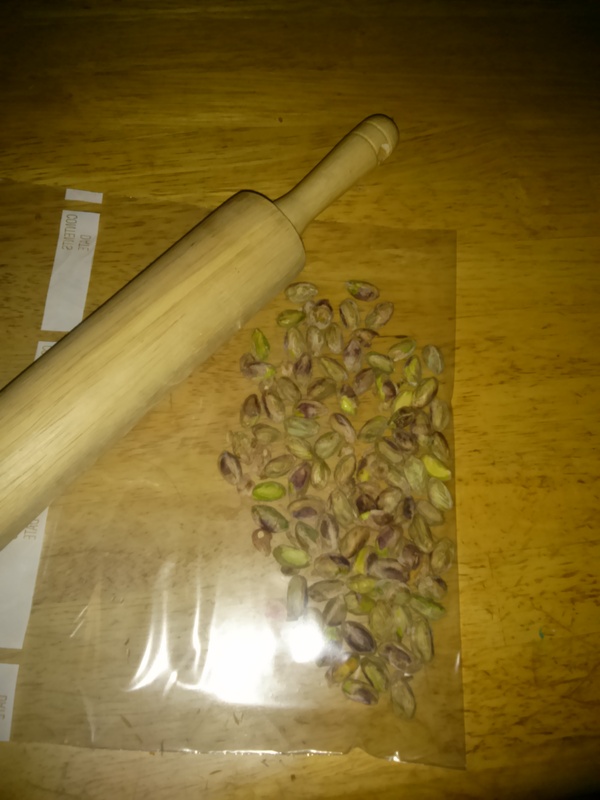 Then I crushed the pistachios with a rolling pin while they were inside the Ziploc bag. At this point I attempted to make whipped cream out of the heavy whipping cream. After 15 minutes it still looked like milk. My wife told me I wasn’t ‘whisking’ hard enough. 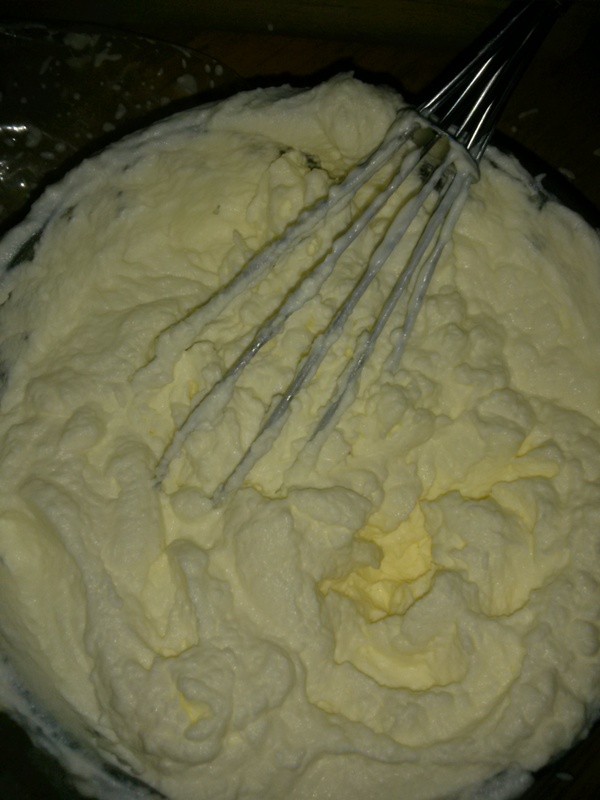 She briefly showed me how, and after I ‘whisked harder’ the heavy whipping cream looked like whipped cream. I put the whipped cream in the refrigerator and returned to the oven. 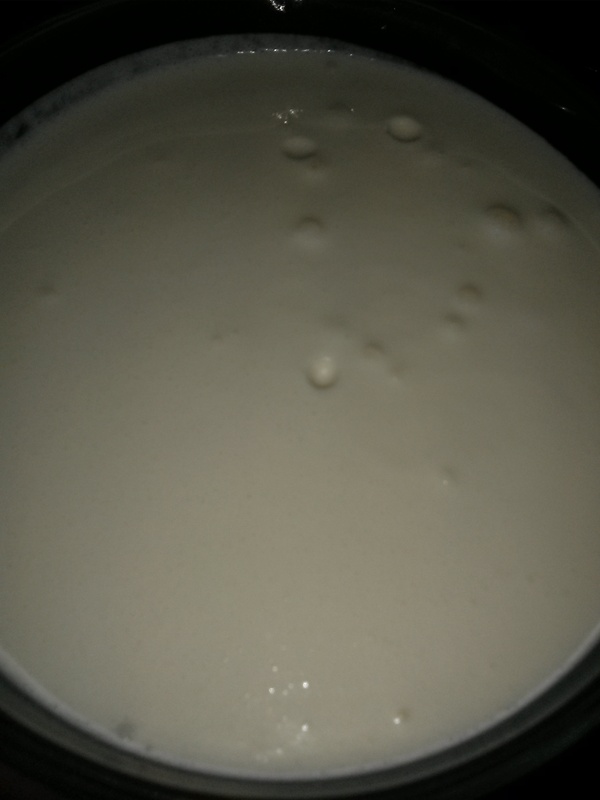 This is what the heavy whipping cream looked like after 10 to 15 minutes of gentle whisking. Basically it still looks like milk. Hmmm… the coffee icing is not thick after two cups of sugar??? 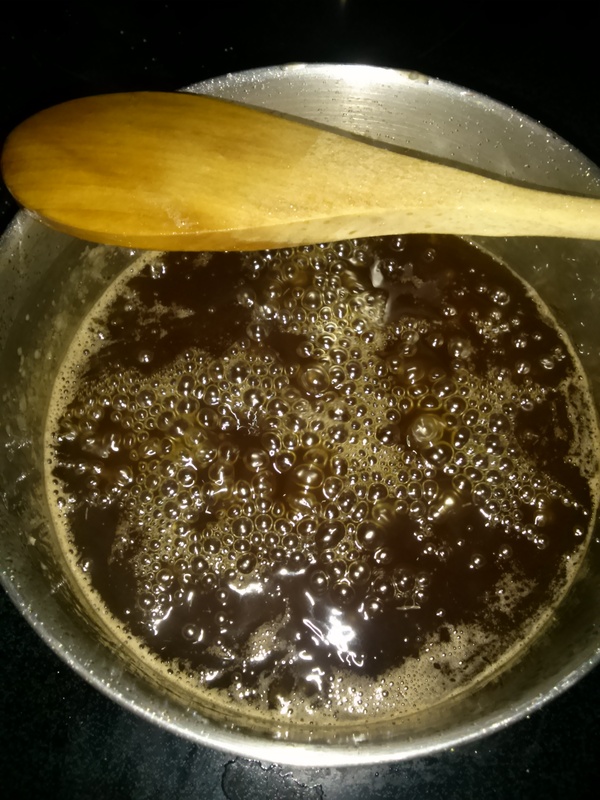 The boiling coffee icing still looked like syrup. At 9:10 p.m. I removed the coffee icing from the heat for it to cool. Then I checked the bird’s nest pudding baking inside the oven. After 42 minutes of baking the pudding was still runny. I brushed the top of the bird’s nest pudding with butter, sprinkled on sugar, and left it to bake longer in the oven. And then left it longer. At 10 p.m. the pudding seemed done. The bird’s nest pudding comes out of the oven… after nearly two hours of baking! I placed the bird’s nest pudding on the counter for a few minutes to cool down. At 10:13 p.m. I did a taste test. This pudding was not good. My wife tasted it and thought it was okay. I told her she did not need to be nice to me, but she still insisted it tasted okay. She even said she would eat more the next day, while I would have been content feeding it to our chickens. It tasted very bland as I recall most British food to taste. But this was from a French cook book! I instantly wished I had not sprinkled sugar… but instead added a cup or two of sugar to this recipe. 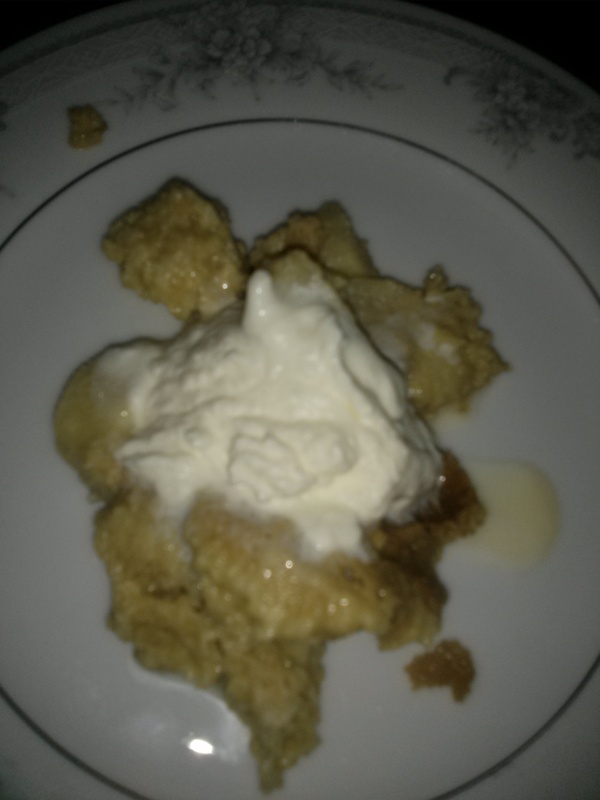 Two recipes I found online for bird’s nest pudding and bird’s nest pie list over a cup of sugar to be added to the recipe. Blah! I wonder if the French sprinkling of sugar equals two cups of sugar. Now I began to feel pressure. I was cooking TWO dessert items. Would either turn out? The coffee icing had not thickened by 11 p.m. Tuesday night, so I put it in the refrigerator to cool overnight. My plan was to put the icing on sugar cookies that I purchased… but if it didn’t thicken then it might be better for pancakes. At 4:32 p.m. on Wednesday I checked the coffee icing. It had barely changed in thickness. Why? This I am unsure of because two cups of powdered sugar added to 3/4s cup of black coffee should have been very thick. My wife expected it to be a solid sheet of candy that I would need to melt down. 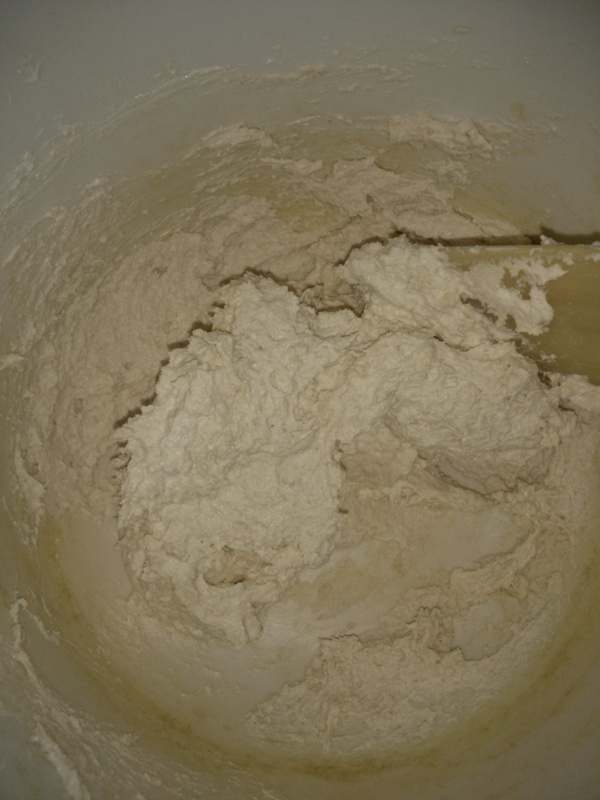 Instead overnight it had not thickened at all. If I had more money I would experiment with this some more because I have no idea why this icing did not thicken. The recipe does not say how much sugar needs to be added to make a thick cream, but I felt like I added enough sugar to guarantee a heart attack. As a syrup it tasted very good. Sigh… two disappointing cooking outcomes. My conclusion, if anything can be concluded from this, is that I do not like desserts. That was already known. So like so much other scientific research my experiment simply complimented (reinforced) existing knowledge. This was disappointing but not ego crushing. My ability to cook chili (meat or vegetarian) is very good. I can also cook steak, vegetables, and various dishes that go far beyond the skill requirements of a microwave dinner. While I am writing this report (attempting to write it) the kids have been put in timeout more than once. While I was cooking the kids were put in timeout more than once. I reiterate: There was no mention of children in the obituary of Alice B. Toklas. I’m convinced if she had kids she would have just ordered pizza! Love this narrative – I can’t even count how many times I’ve had giant kitchen aspirations only to have disappointing results. I’m a huge dessert person, though, so I’m sure I would’ve put a dent in these either way!